This story was updated at 1:46 p.m. EDT. Illegal drugs discovered at NASA's Kennedy Space Center in Cape Canaveral, Fla. have prompted an investigation into how the substance ended up at the Florida spaceport. NASA officials found 4.2 grams of a white powdery substance on March 7. Initial on-site tests by the police indicated that it was cocaine, but the substance is now undergoing follow-up tests, said Renee Juhans of NASA's Office of Inspector General (OIG), which is conducting the inspection. "Law enforcement personnel field tested the substance – which indicated a positive test for cocaine. The substance is now at an accredited crime lab for further testing," Juhans told SPACE.com in an e-mail. Juhans was unable to provide additional details about where the substance was found, or how many employees and contractors are now being drug tested. "Anything found would be turned over to a federal prosecutor," NASA spokesman Allard Beutel told SPACE.com. This is not the first time that drugs have been discovered at the Kennedy Space Center, where NASA maintains and launches its space shuttles. A similar investigation was conducted in January 2010 after a bag containing a small amount of powdery cocaine residue was discovered in the space shuttle Discovery's hangar at the Kennedy Space Center. The hangar, which is known as the Orbiter Processing Facility, is a restricted zone only open to shuttle workers. Approximately 200 NASA employees and contractors who had access to the area underwent drug tests, but none tested positive for cocaine. The investigation was eventually closed without any disciplinary or legal actions. NASA has a firm zero-tolerance policy toward drugs on its property, in accordance with federal law, and agency workers or contractors are subject to random searches if needed. "We're subject to federal government guidelines, and there are a fair number of positions that have that prerequisite ahead of time and also require it randomly," Beutel said. The new drug investigation comes just a day after a tragic incident at the Kennedy Space Center's Launch Pad 39A. 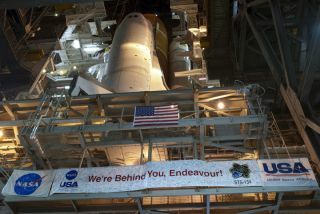 Yesterday morning (March 14), a 53-year-old engineer fell to his death at the launch pad where the space shuttle Endeavour is being readied for its final launch next month.